Alabaster Medicine Beaver Fetish 2. $45. Beaver, normally shy, shows himself to the world in this silky, touchable fetish. 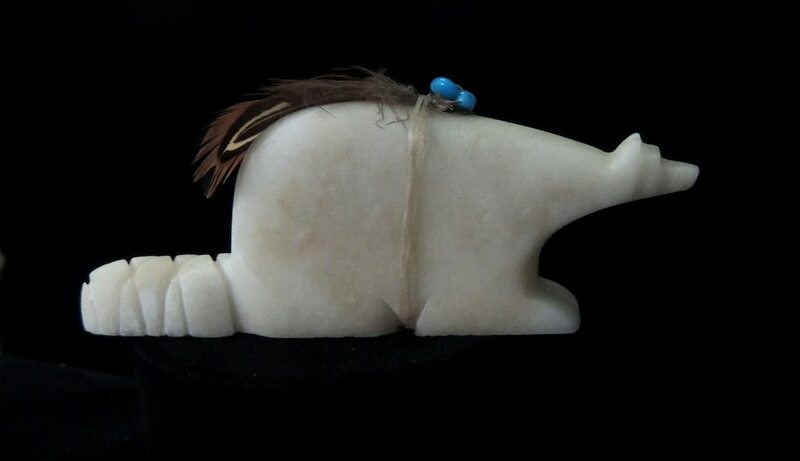 Hand-carved of cool white alabaster by Jeremy Gomez (Taos Pueblo), he keeps his features subtle except for his proud cross-hatched tail. Turquoise beads and colorful earth-toned feathers make up his medicine bundle. Stands 4.75″ long by 1.25″ high (dimensions approximate). Posted on Sunday, October 19th, 2014 at 7:57 pm. Filed under: Fetishes	RSS 2.0 feed.